All Collingwood Parents and Morven Students invited. Frank Giustra, Amed Khan, Treana Peake and Lisa Wolverton join us to discuss smart and effective philanthropy. Sharad Kharé will be the evening's Moderator. This powerhouse combination of amazing individuals will share insights about how to vet the organizations we engage with, how “we” as a Collingwood community can model service effectively to our children and students—and in the process set our kids up to be mindful, informed and effective change makers in the world. Frank Giustra is President and CEO of the Fiore Group, a private firm managing a broad portfolio of private equity investments and companies, specializing in food and lifestyle, art and entertainment, and natural resources. Mr. Giustra has an established track record of building natural resource companies through access to capital and creative deal-making. As President and later Chairman and Chief Executive Officer of Yorkton Securities in the 1990s, he grew the firm into a leading natural resource investment bank. As Chairman of Endeavour Financial from 2001 to 2007, his vision and leadership led to the successful launch of numerous resource companies, including Wheaton River Minerals Ltd. (acquired by Goldcorp Inc.), and Silver Wheaton Corporation. Mr. Giustra's entrepreneurial success includes founding Lionsgate Entertainment, now one of the world's largest independent film companies. Mr. Giustra is a major shareholder of Thunderbird Entertainment, a company focused on content and distribution in the television and film sector. In 2014, he founded Fiore Music and Westsonic Music Inc., and actively composes lyrics for songs in all genres. Mr. Giustra is a strong believer in philanthropy, and devotes much of his time to a variety of causes both locally and globally. Mr. Giustra brings an entrepreneurial approach to philanthropy to catalyze new ideas and innovations that can be scaled and shared. Most recently, the Giustra Foundation has become actively involved in the global refugee crisis by providing humanitarian aid in Greece and Turkey, along with being the founding partner in both The Ascend Collaborative and the Global Refugee Sponsorship Initiative. Mr. Giustra sits on a variety of non-profit, private and public boards. Mr. Giustra is Chairman of Leagold Mining Corporation, and a board member of Thunderbird Entertainment. In addition, he sits on the boards of the Elevate Social Businesses, The Bill, Hillary and Chelsea Clinton Foundation and International Crisis Group. Amed Khan has had an active career in both the public and private sectors, including a wealth of experience from political campaigns, government service and international relief work. Mr. Khan currently directs Paradigm Global Group, a private international investment firm with a focus on Commercial Real Estate, Energy and Technology. He is the founder of Elpida Home, a public private initiative based in Thessaloniki, Greece that provides refugees the humane international protection they are entitled to. Mr. Khan held several positions in the United States government including the Director of Operations for the G-7 Summit of Industrialized Nations in 1997. Between 1993 and 1995 Mr. Khan was Special Assistant to the Director of the United States Peace Corps, where he served as the Director’s personal representative on policy and administrative matters including liaison to the White House and coordinating the recruitment and selection of Peace Corps Country Directors. Mr. Khan’s political experience includes serving as Chief Operating Officer and Director of Administration for the 1997 Presidential Inaugural Committee and Deputy Chief Operating Officer for Clinton/Gore ’96 where he managed planning for the Democratic National Convention and Presidential Debates as well as management roles in the 1992 Presidential Transition and the Clinton/Gore 1992 Presidential Campaign. Mr. Khan worked for the International Rescue Committee (IRC) in Tanzania where was Chief Administrator/Logistician overseeing overall refugee camp administration and financial management. 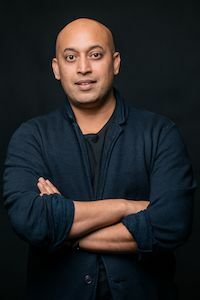 Over the last decade, legacy documentarian Sharad Kharé has been engaging with some of the world’s most interesting individuals in dialogue in regards to their digital legacy, personal legacy and living legacy. Sharad has video documented and interviewed people like His Holiness the Dalai Lama, Meryl Streep, Helen Mirren, Jack & Suzy Welch, Chip Wilson and more on his lens. See his work here and his corporate site here. Sharad is just as busy in front of audiences as he is behind the camera as his background as a speaker and moderator have continuously brought him to the most engaging stages and in the world including TEDx, The United Nations, and Harvard University to mention a few. Sharad has been known to travel anywhere in the world that the story takes him, always in pursuit of new and exciting legacy projects to create. His signature interview style is to have a one-on-one dialogue that covers the person’s life journey from beginning to present, comfortably bringing out candid and interesting stories through conversation and unscripted interaction. Sharad holds a Masters degree in communications, where his academic research focused on personal and digital legacy. He uses his background in journalism to bring out the best conversations between individuals and the people they impact. These video pieces act as a timeless record of achievement for the subject. He has spent the past several years traveling the world seeking out the most influential people in their fields in order to document their legacy for public and private consumption. His Legacy work can be explored here. Sharad is currently on the board of the Laurier Institution and currently the President of TIE Vancouver which is a chapter of a global entrepreneur group that mentors and advises some of the most active entrepreneurs in the world. It began with a white envelope of money. I am the founder and Director of LMW Consulting; a small advisory firm that assists both philanthropists, foundations, social enterprise and businesses alike in strategy and organizational development enhancing performance to better fulfill their missions and improve service delivery. I am also a member and current Chair of the Board of Directors of The Philanthropy Workshop, a donor network of 450 members in 22 countries. The Philanthropy Workshop’s mission is to drive social impact by mobilizing a global network of strategic investors bound together by their commitment to excellence, collective action and entrepreneurial approaches to the world’s most urgent issues. Our family owns and operates the Pacific Investment Corporation, a family-owned real estate holdings and investment company. But philanthropy has also been an integral part of my family’s values and thus an integral part of our family operations is our family foundation. The Wolverton Foundation is a small Vancouver-based, private family foundation dedicated to elevating exposure to the arts and facilitating artistic programs for those children who would otherwise be excluded from these opportunities. We facilitate our granting with our longtime grantee partner, The Sarah McLachlan School of Music, by providing a permanent home for the school in East Vancouver. I am the current Director of this family foundation. I am an active philanthropist and advocate of women and children. In 2009, I founded the Canadian nonprofit, GenerationChild, an organization that provided small grants to community based organisations working with vulnerable children in the Middle East. This foundation ran for nine years and provided over $500,000 of small grants to grassroots organisations. As an investor that believes in the importance of critical conversations that elevate women and girls, I also chaired the international conference, The Next Billion: Women and the Economy of the Future, that took place in Vancouver in May, 2015. This global gathering brought together senior-level corporate leaders and institutions – the IFC/ World Bank, the Inter-American Development Bank, the UN foundation and the European Bank for Reconstruction & Development, to discuss practical ways in which women as consumers and employees, entrepreneurs and executives are critical to the continuing success of companies in today’s competitive, international economy. I served on the Board of Directors of UNICEF Canada for six years. I am a former member of the President’s Council of the International Crisis Group, a nonprofit organization dedicated to preventing and resolving deadly conflict. I am also an active mentor for the Loran Scholarship Foundation of Canada. I currently reside in West Vancouver and I have three beautiful children.